Home | This Weeks Cut | Episode 6: So you want to be a knife maker?! I have gotten a lot of questions over the years about becoming a knife maker. 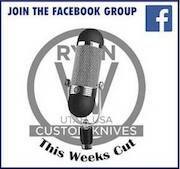 I thought it would be cool to talk to all those just starting out in the making of knives… Pretty basic info in this episode! let me know if you like it!